“Judge Hunters” from the generally pretty awful, but on the whole pretty good looking “Judge Dredd” (1995) film. 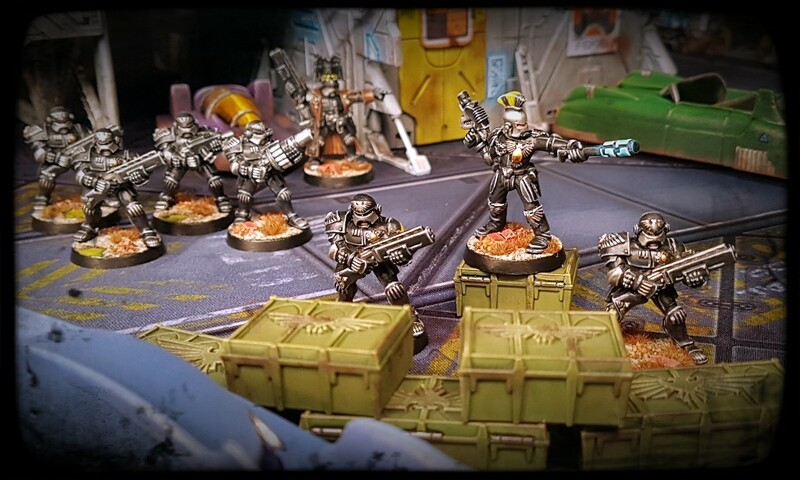 The final catalyst that I needed to paint a small Arbite force after wanting to paint them for years was to get them used in some games of Shadow War: Armageddon. You can see some snaps taken during their debut outing here. 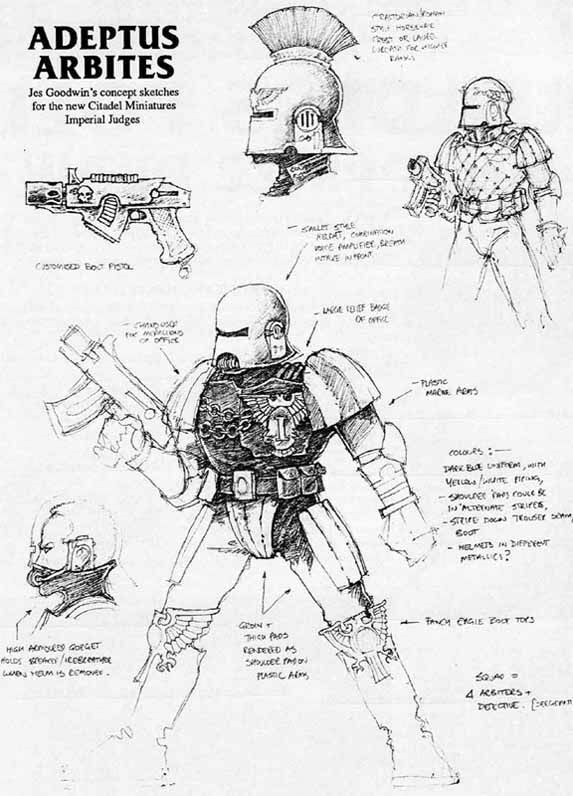 Arbites are not a faction currently available for use in that game, but their armour, arms and equipment map onto the Space Marine Scout list reasonably well. It means that the Arbites are a bit tougher than they should be, but it is close enough. It was subsequently pointed out to me that I could have fielded the Arbites as veteran guardsmen in carapace armour, but I somehow missed that. No biggie. In order to make sure that I had some suitable options for playing a few linked games with the force, I wanted to have a couple of recruits and a “Special Operative”. 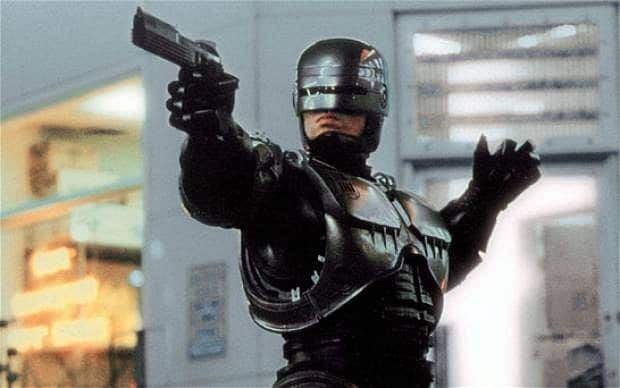 In Mega City One, the city where Judge Dredd patrols, a rookie Judges final assessment is a day patrolling with a veteran Judge. The rookie calls the shots and the veteran observes. You may recognise that as being essentially the plot of the 2012 “Dredd” movie. That final test is known as Full Eagle Day, as if successful the new Judge will get to wear a full eagle badge rather than the half badge worn by rookies. Judge Von Sydow leads Rookie Judge Rennie through the ruins of a rad zone. In reference to that quirk of the Judge Dredd setting (and also as a practical way of distinguishing the rookie Arbitrators from the regular Arbitrators) I only painted half the eagle on the shoulder pads of the rookies in silver. I treated the rest of the design the same way as the black plate elsewhere on the model. Using the older design of Arbite leader to represent a veteran was a straightforward decision. With the crest and other different design elements its fairly easy to handwave away a higher armour save as being due to artificer carapace design or something like that. I suspect that aspects of the buckethead design of the Arbite leader from 1990 was based on the bucketheaded design of another man-in-uniform that makes me weak at the knees. So the metallic bucket helmed Robocop concept followed through the leader into the entire project. Some justice being liberally dispensed on Curis space pirates a few months ago. Although I have some more Arbites that I would like to paint, that’s enough of them for now. I hope to return and paint a few more in the not too distant future. That said, depending on how the new Necromunda develops, I hope to field these guys in that too. I’m impressed your hands had stopped shaking long enough to get that photo of the Sunday BOYL game. They’re a lovely squad. Your black’s come out nice and rich in the end, and makes them look cruel and faceless authority figures. Nice to see actual Arbites models for once too! Future fascist was the most important bit if atmosphere that I wanted to convey, but I added a few more colours in the end. They needed the exaggeration. I’m glad that they still give off that faceless authoritarian vibe, thanks for the feedback Curis! It’s a lot of fun seeing figures first seen on the internet from thousands of miles away in hand, in addition to meeting and gaming with the painters of course. Pathetic as it sounds, I did squee seeing Inquisitor Verhoven in real life. I have squeed at far less, as have all readers of these comments. The hobby is all about narrative. Some characters get more screen time and – in their own tiny way – gain fame. Squeeing at a mates painted toy soldier is much better than squeeing at some z list celeb walking past, that’s for sure. It’s a really nice squad, with a great colour scheme. I’m enjoying the Robocop and Dredd notes in there, with a hint of 1984. Delicious. The eighties goes in and out of fashion these days, but they were critical years in the formation of this particular old geek. These guys do tie a few of my very favourite pop culture things together though, grody to the max! I’m hoping to give these a while new lease if life via Necromunda V2 in the not too distant future. I really like how you go almost always refer to the TRUE HISTORICAL RECORD for all the painting details. Great Squad. I like to know and think about “The Rules” before I paint something like this, and usually go for my own take on it. This is great , I actually learnt about the rookie half eagle only just now ! It’s a kinda daft visual when it’s presented in the comics, but the half eagle motif worked here I think. I’m glad that you liked them A-man! These are a fine collection of models. I really enjoy the sinister black and silver, set off by very restrained colour application (the stripe on the grenades in the carousel, the yellow banding on the champion’s crest, the natty dark brown trenchcoat). 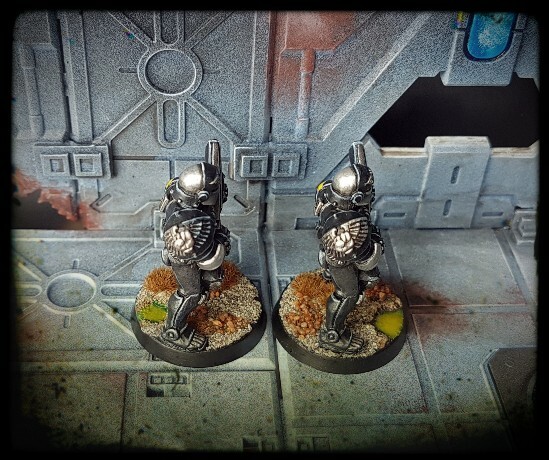 The bases enhance that even further – a marked contrast between the monochrome fascist footsoldiers and the vegetation they’re trampling on. I feel like someone just complimented a new hairdo! Excellent as always. As others have mentioned the black and silver gives a classic authoritarian vibe that is perfect for the arbites. So what is next? Specialists like sniper and dog handler? Plain clothes detective types? (Sherlock Decker with a side of “break your face”) Or riot shields and electro-truncheons? I have every single one of those shrewdly deduced options lined up for future inclusion, but not for a while yet I expect. I’ll wait until something comes along that gives me the next burst of enthusiasm, rather than force myself to paint more right away. An urban pacification vehicle would be nice, particularly after seeing the lovely one that Axiom coincidentally posted today. What about terrain? Arbite precinct house? (maybe made from the bastion with a low wall and only 25% of the heavy bolters?) A bunch of those Judge Dread lock posts? Pacification or lockup vehicle would be useful too. Maybe some sort of open top speeder which would hark back to Judge Dread a bit more. A precinct house is in the works, as are a few vehicles. Holding posts too believe it or not. I have Pat-Wagons from the Dredd range that I hope to paint in a way that will make them cross compatible with Arbites. Lots of plans, not enough time. Brilliant stuff, Cheetor. Seeing your Arbites here, done so well, only makes it more likely that I’ll get onto my own half-painted carapace armoured guys from years ago sooner rather than later. I’m glad to hear it Azazel. You will do a lovely job on them I’m certain. 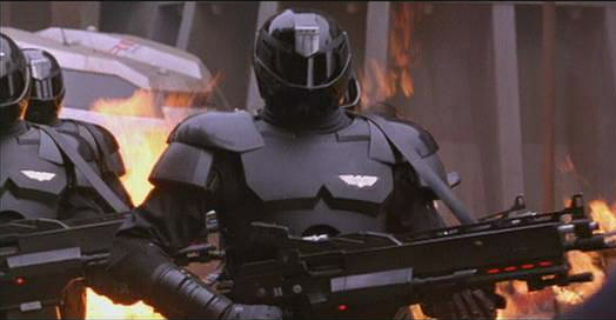 I’m not sure what is so appealing about space cops, but they are rad. Great work on some very nice models. Nice of you to say Warburton, thanks. They are nice sculpts, classics really. I nearly sold mine a few times. I figured that as I have various Dredd related models – painted and unpainted – I probably didn’t need a second set of similar space cops. 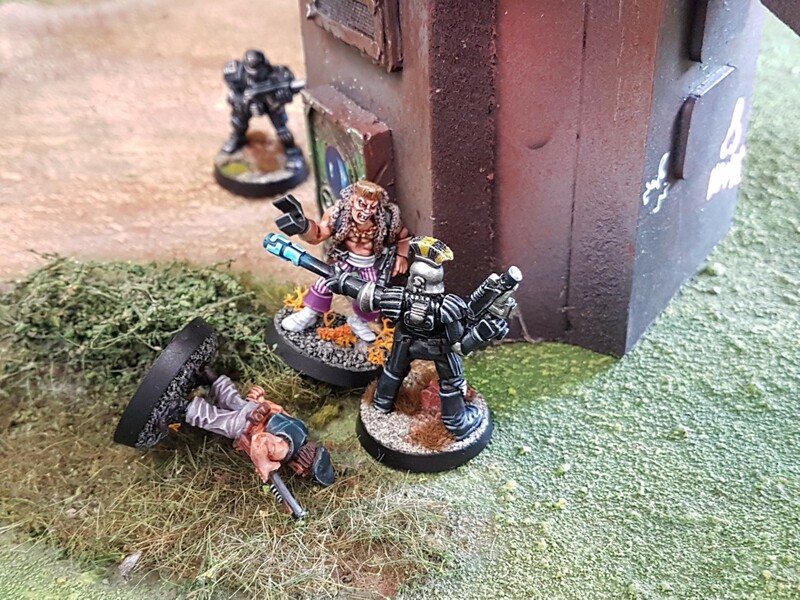 New Necromunda is a pretty good motivator to tackle a few don’t you think? You will of course do a fantastic job on them when you get to them DrM. Your arbites are fantastic Suber, definitely something to aspire to. I would like to have about twenty painted at some stage, with a vehicle or three, like you have. Did you ever repair that Arvus that you dropped during a game report? I hope so. It looked good with the Arbites. I gave the palette a bit of thought. I wanted them stern, anonymous and blank, but I didn’t want them to look dull. I am pleased with how they worked out. Aw, cracking job mate, they look fantastic, and I love all the little nerdy Easter eggs like the half badge and the Robocop inspired lid – top draw sir! The geeky Easter Eggs are there for those interested, but don’t exclude people who are not in on the joke. It sounds a little pretentiously high concept, but informing one medium (toy soldiers) with others (comics and film in this case) often results in richer work. Plus it’s fun. I’m glad that you like them Alex, thanks for commenting.